First, let's understand what the words "Bar (or Bat) Mitzvah" actually mean. The phrase translates as "son (daughter) of commandment" – i.e. 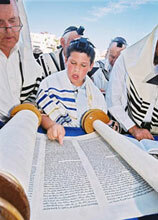 the young person becomes responsible to observe the commandments (mitzvot) of the Torah. The purpose of the commandments are to keep our lives focused on what's truly important: family, community, and a relationship with God. Although we commonly refer to "having" a Bar Mitzvah, technically speaking, this is impossible. The term "Bar Mitzvah" refers to a status, in the same way that being a student or parent is a status. On a deeper level, just as their bodies are growing and changing, so too their souls are growing and changing. Kabbalistic tradition says that a person's spiritual being has several levels of soul. A new level of soul (called neshama) comes into awareness at Bar/Bat Mitzvah time. This is the time when moral awareness and sensitivity fully develops, enabling young people to take responsibility for their actions. One's actions after reaching this stage of life are considered more significant for another reason: The Talmud explains that a mitzvah performed because one is commanded, is considered greater than a mitzvah performed voluntarily. This is because a person has a natural aversion to fulfilling an obligation. Overcoming this aversion is a sign of maturity, and this is what the Bar/Bat Mitzvah celebrates – reaching the stage of obligation. Colloquially speaking, when people say, "I had a Bar Mitzvah," it means that they had an aliyah to the Torah in synagogue. "Aliyah" means to "go up" to the bima. Following this, the bar mitzvah boy reads a portion from the biblical prophets, called the Haftorah. During a period of persecution 2,000 years ago, Jews were forbidden from reading the Torah, so they instituted a reading from the prophets that corresponds to the theme of that week's Torah portion. The Haftorah is read with a unique traditional melody. There are different practices regarding what is done at a Bar Mitzvah celebration. It is proper for the young person to relate some Torah thoughts at the celebration – i.e. the famous Bar Mitzvah speech. The speech usually contains ideas from the weekly Torah portion, and emphasizes the young person's commitment to Jewish values. And what about that Titanic-themed party with Hollywood-style special effects? It's important that the festivities should not become so ostentatious that the spiritual significance becomes secondary. The new adult should appreciate that this is a celebration of maturity and responsibility, a message which will carry through for the rest of their life. With that in mind, my favorite gift idea is a tzedakah (charity) box. Every Jew should have a tzedakah box in his home, so he can drop in change on a regular basis. The money can then be given to support a Jewish school or institution – in your home town or in Israel (every Jews' "home town"). There are beautiful tzedakah boxes made of wood and silver, and you can see a selection here. • Triumph – Aish.com's popular book of inspiring true stories of challenge and spiritual growth. If all else fails, you can always give money. It is a nice idea to give $18 (or some multiple thereof), since the numerical value of 18 in Hebrew is "Chai," which means "Life." 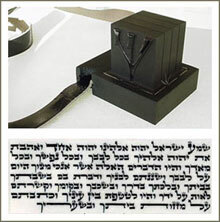 Inside each tefillin box are parchments containing four Torah sections, which speak about God's unity, the obligation to observe the commandments, and the responsibility to transmit Judaism to our descendants. If you're really feeling generous, Tefillin is a wonderful gift for a Bar Mitzvah boy. Owning a pair of Tefillin (and wearing them!) is an important part of Jewish identity. But since they are expensive (about $400), not every Bar Mitzvah boy has a pair. To make sure you get kosher Tefillin, see here or here. Now here's a Jewish trivia question: Who was the first person to have a Bar Mitzvah? We refer to these laws as Torat Chaim, literally "instructions for living." Torah is the ultimate "owner's manual" for maximizing our pleasure and potential in life. Torah is a basis for life's most important questions: How can I live a meaningful life? How can I build successful relationships, deal honestly in business, and fulfill my personal potential? How can I really make a difference in the world? Torah study emphasizes building a rational basis of belief, to engage one's mind, stimulate the intellect through questioning and debate, and thereby nourish the soul. It does not endorse a leap of faith, all-or-nothing decisions, or disengagement from the world. The goal of any Jew is not only to study the Torah, but to become a "living Torah," who embodies the lofty ideals of "love your neighbor," "peace on earth," "justice for all," "universal education," "all men are created equal," "dignity of the individual," and "the preciousness of life." These concepts all originate from the Torah, and these have defined the moral makeup of humanity. In Jewish life, a Bar/Bat Mitzvah does not represent the culmination of one's Jewish education, but rather a stepping-stone to a more mature and profound relationship with Jewish learning. Bar/Bat Mitzvah means to become educated, and to strengthen one's Jewish pride through knowledge and understanding. It means to grow Jewishly, one step at a time. It means standing up for Israel and respecting every Jew. It means taking responsibility for the world, using the Torah as our guide, because that is the mission of the Jewish people. And most of all, it means to love being Jewish. This is a wonderful article. I am an owner of an event company that is getting more and more requests for celebrations. Is there a particular piece of resource available that I could share with staff to ensure the proper respect and questions are asked of the familes surrounding tradition. I just got an invitation to my best friend's bar mitzvah. I had no idea how to act and this has helped me greatly. Thanks! It is disgusting the way that bar/bat mitzvahs have become an excuse to embarrass people who don't have the wherewithal to throw an extravagant buffet or party. A bar/bat mitzvah used to be a spiritual event; now it is almost like a wedding. When we die, we're supposed to be wrapped in a simple shroud and buried quickly. That came about because even the dead were dressed to the hilt while poor people couldn't afford to be buried in a $3,000 silk suit. The poor among us are forced to scrimp and save so that their son or daughter won't be embarrassed when mom or pop can't spring for an expensive catered buffet. I think that all post-bar/bat mitzvahs should be plain and simple even if the parents can afford to spend $10,000 or more. There are more Jews who cannot afford to do a luxurious spread. It is a shame that such an important event has lowered its importance as it has. Of course, more and more kids think of their bar/bat mitzvah as a get out of shul free card. They never learn about Judaism, never learn what it means to be a Jew. That is sad and disgusting. One thing that has bugged me for years is how people pronounce Judaism. Look at it. Juda ism. So why do people say Judy ism? I know who Judah was, but who in the blazes was Judy? Or are they trying to say Jewde ism? It is Juda ism. If we are going to have Judaism around in the next 50 years, we are going to have to start having post-bar/bat mitzvah classes where our kids can be taught the importance of remaining Jews and marrying Jews. Or isn't it important to us to keep a 3,000 year faith continuing? You really take this seriously, but was a rant really neccesary? I really enjoyed this article. It has helped me appreciate the significance of the bar mitzvah celebration I will attend next Saturday. Isn't the true purpose of the commandments to keep us in right relationship to God and then to man? The first five commandments address our relationship to God, our most iimportant relationship. Without a proper relationship with Him we can in no way be in proper relationship with our family and community. I wanted to understand more about what it means for bar mtizvah, since I will be attending my grandson's synagogue event and reception in less than a week. As a Christian, I have much to learn about the Jewish customs, so I can understand and share in this special status of my grandson. Thank you for the ABC's you provided here. Please discuss this and offer ideas for a meaningful event in a young girls life. There are differences between becoming bar vs bat mitzvah. This is a nice overview of becoming bar mitzvah, but I recommend that a separate article be written for the bat mitzvah. No woman of any age (in Orthodox synagogues) is called up to the Torah. Many young women and their families would appreciate a separate account of bat mitzvah practices, separate and apart from her holy brothers. a very well written and informative piece of writing. 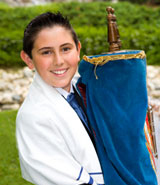 This is a great article with many Bar Mitzvah tips. I appreciated it a lot.. There is a new website, www.themitzvahbowl.com, which is a database of mitzvah project for Bat and Bar Mitzvah students. The site suggests meaningful mitzvah projects categorized by a child's interests. Check it out! Jjust be careful about writing G-d's name see bar mitzvah invitations for more information. Now that you know what a Bar Mitzvah is, make sure you know where to get great bar mitzvah gifts. As an African-American Christian male, raising 3 sons, I am doing a study on coming of age, and your 7 points gave me some wonderful ideas on the biblical basis of assuming adult obligations. Thank you for your insights. Thank you for such a beautiful explanation. Thank you so much for providing this insight. My son is attending a celebration of his friend being called to the Torah as a bar mitzvah..and I was wondering what would be a good appropriate gift for him. this is great im doing a judaism project - briiliant!! Thank you!! i have a religion project to do for my junior cert and its due next week. you have saved my head! i have all my information! thanks a million!! I had to do a report on Bar and Bat Mitzvah. I only knew that it was a Jewish ceremony, I did not know what it was about. This site was very informative and helped me write more then half my project. I recomend this site to everyone who is interested in Jewish Festivals. Thank you! Thank you for the quick overview with recommendations. Very helpful for someone who is shopping for the right gift. Thank You For Helping Me Out. I Have A Very Strict R.E Teacher And Needed To Write An Exam On Bat Mitzvah's, Your Sites Been So Helpful And Interesting. I Really Enjoyed Reading About All The Traditions . Thank You Again ! I have some Jewish friends and their son is doing Bar Mitzvah and I had no idea what it was all about. Your site is very informative. Thank you. I have a lot of jewish friends and had no idea what to give them, or any history of the tradition. Thanks. thankyou so much i had a project to do and this really really really helped me thankyou so much again!!!! i had 2 do an assigniment on this and this report made it possible, thx u guys. omg thx sooooooo much i had a project 2 do on this it rly helped me out so thanx!!!! Hey thanx alot 4 this it reeeally helped and was seriously interestin! Got a friend whos Jewish nd she doesnt talk much bout it so thankyou. now i can really talk to her! I really enjoyed the artical "What is a Bar/Bat Mitzvah? ".I appreciated that there was an artical on the subject. I would love to see more about it. Thanks! what i great site man! Thank you for the information. My daughter is writing an essay concerning bar/bat mitzvah for RE. It helped us understand the meaning and importance of this celebration. I needed this information of a school project!!!!!!!!! Thank you for this piece of information because i am doing an assignment on bar mitzvah and it has helped to understand alot about judaism. It talks about what happens at a bar/bat mitzvah. Thank you I really neeed this information for a project I am doing.I finally know what really happens,and why they celebrate it. Hey I had a project to do on a rite of passage or a coming of age ritual and i choose to do bar and bat mitzvahs this web site really helped me find the information i needed thanks... Amber L.S.S Kingston Ont. just wanted to let you know that youve really helped me alot with my GCSE r.e coursework about judaism. im on section b. which is all about the Bar/Bat Mitzvah ceremony! this is an amazing site i got so much information on my religion thanks guys!!! hey in RE i am doing a project on judaism. your website has really helped me. i would just like to say thankyou!!! i think your articles are AMAZNG good job keep up the good work! thanks so much! your website made me understand more about bat/bar mitzvahs and really helped me with my prep! thanks! thank you for haelping me.this site helped. thank you for a brilliant website. it really helped me with my homework on both bar and bat mitzvah. if i didnt find this mr price would have killed me. thanks to your page i have received alot of information on a bar mitzvah so i could finish my religios studies homework. i think your page would help alot of people if they are having a bar mitzvah or not. Thank you. When I had visited Israel,I could not visit the Wailing Wall because of some unfortunate circumstances. This website really gives me a feeling of almost being there. Thanks.